“Orange Is The New Black” debuted in 2013. As you may recall, it received tons of praise from critics and fans alike. A rare all-around hit – and rightfully so. It was an enjoyable show, in that Netflix kind of way where you would find yourself watching episode after episode without really thinking about it. It also allowed women to be characters in a way they have often been robbed of over the years. Full, colorful, complicated characters. It felt fresh. The problem I always had with “OITNB” was that Piper Chapman, the main character, was never as interesting or complex as the other characters (at least in the show’s early-going). Things tended to drag when Piper showed up, particularly when the show briefly devolved into a story about her and her husband Larry or whoever. That sucked. 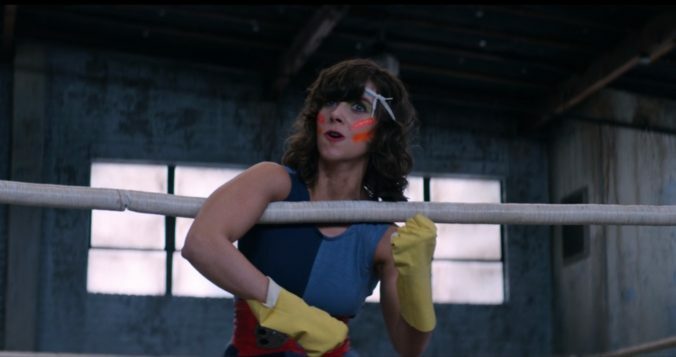 “GLOW” tells the story of a struggling actress named Ruth Wilder (Brie) who is desperately trying to find work in Hollywood. And not stereotypical women’s work either. She wants to play big, compelling characters like any man would have the chance to do. (The show opens with her intentionally reading a man’s part during an audition and pretending it was an accident.) Her friend, Debbie Eagan (Betty Gilpin), seems to have a perfect life after her time on a soap opera. Ruth is jealous. Then Ruth stumbles onto an opportunity to join some kind of wrestling show directed by a scumbag named Sam Sylvia (Marc Maron). Many other women come to try out as well. Story ensues. The thing about the show is that it’s perfect. The characters unfold at just the right pace, identifying themselves to the viewer with entertaining quirks and developing into compelling characters as things progress. The writing functions like a series of perfectly interlocking gears, spinning comfortably in motion and bringing stories together in ways that are at all times surprising, sensible, entertaining and emotional. The aesthetic feels very distinct, in the way I suppose I would imagine a 1980s Los Angeles to feel (someone from there can tell me if I’m wrong, but basically: kind of gross and scummy but full of hope and cocaine?). Brie (speaking of perfect*) is the show’s beating heart, as TV critics like to say. Rooting for her as she goes through her daily life is easy, despite everything she does that is contrary to her outwardly upbeat and proper personality. She is ambitious, nervous, hopeful, hopeless, broken, and confident. Her thoughts and feelings are always written on her face. *The only false note in the show so far is Maron’s character, Sam, telling Ruth that she is sometimes really ugly to look at, which is obviously an insane thing to say to and about Alison Brie. I want to write more about “GLOW” when I finish it, but for now I kind of just want to hang out inside of it. It’s the kind show that envelops you, fully engaging your brain will simultaneously switching it completely off for a while. When it’s over, you just feel warmer. It makes you want to smile. I guess you could say … it makes you glow?